Now that we’ve had our solar panels for over a year, we have a better picture of how much energy they will produce/offset during the various seasons and daylight hours throughout the year. Along with a running tally on the bottom of the screen, showing how much carbon dioxide we have offset with our system. To date, we have offset 16,599 pounds, the equivalent of 7.9 mature trees. I love that! And while the carbon offset alone puts a smile on my face, what makes me smile even bigger are the savings, which I calculate at $3287.92 during the first year of our panels. Here’s how I arrived at that number. The year prior to our solar panel installation, we paid $4956.49 to Southern California Edison. I know!! Can you see why we were very motivated to go solar? Keep in mind, we did not have the roof space and elevation (this is all analyzed by Solar City’s engineering department – you don’t have to worry about this) to offset our entire energy bill. 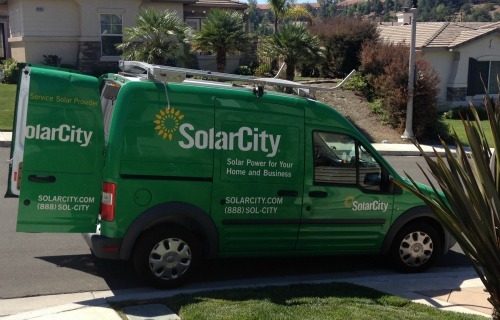 Solar City did make it clear that we would still have a bill from SCE each month. Some months the bill is almost nothing, and other months – like over the holidays with short days, Christmas lights and lots of parties – it’s higher. 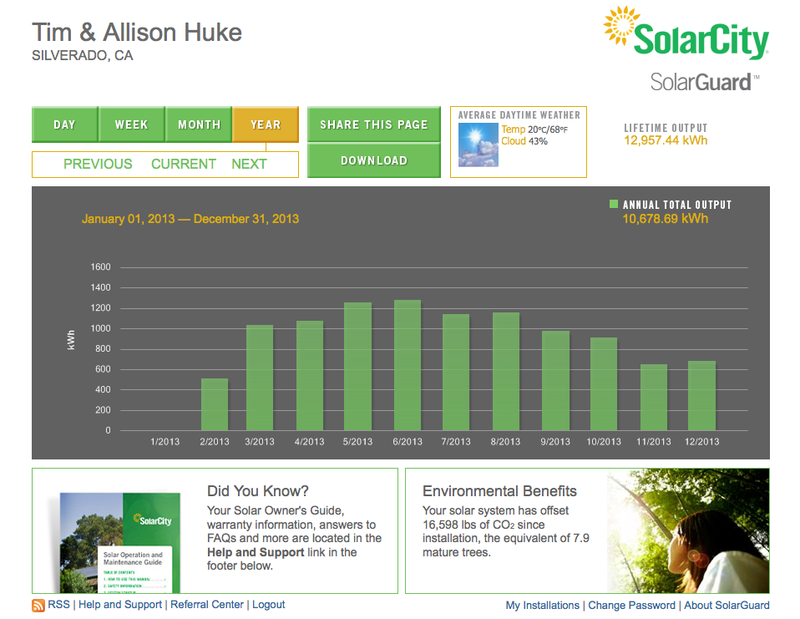 All together, we paid $2203.37 to SCE during our first year of solar panels. However, this number needs some adjustment. Our post-panel energy use is skewed higher because at the same time we installed our solar panels, we also added an electric car and charging station in our garage. This is not an energy expense that we had prior to installing our panels. All other things remaining constant, this should be backed out of our total energy expense to generate a true comparison. Using a basic online calculator – which estimates that our car costs $.0382 per mile to charge in California – driving 14,000 mile in our first year – our car had an energy expense of $534.80. Once you subtract this new, additional expense from our $2203.37, the total is $1668.57 in the first year with solar, as compared to $4956.49 in the year prior to going solar. Overall savings $3287.92!! Not to complicate the numbers, but I think its worth mentioning that the $534.80 cost to drive 14,000 miles is a separate and additional savings. If you compare it to a car that gets 30 miles per gallon on average and gas cost of $4 per gallon, an equivalent gas-powered vehicle would have been $1866.67 to drive the same vehicle over the same time period. If you do not back out the expense of charging the car, and instead you take $4956.49 paid to SCE and $1866.67 spent on gas, you get a grand total of $6823.15. Compare that to $2203.37 we paid for electricity in the first year (including cost of charging the car), that’s a savings of $4619.78. Also, just as important to me as the savings, that is $4619.78 not spent on dirty, non-renewable, fossil fuels. Woo-hoo!! Of course, our solar panels do have a cost. As I mentioned in previous posts, we chose Solar City’s pre-paid program, where we pre-paid our energy for the next twenty years. The total cost of our panels was $18,784 – total cost for all installation, warranty, maintenance, and energy generation for the next twenty years. We will never owe another dime for our solar energy. If you are interested in more about financing and paying for solar, I have lots more information in this post – Journey to Solar, Part Two, Financing. So, our initial $18k investment will be paid back in five and half years with our current savings. Everything after that is pure money in our pocket. Keep in mind that is calculating no increase in utility rates during that time – which we know is never the case. In fact, fossil-fuel energy prices rise by 39% on average over a ten-year period. Our savings will begin to skyrocket over the next twenty years, as solar remains constant, SCE raises their rates year over year, and I continue to look at every nook and cranny of our house to find ways to reduce our energy consumption. I only wish I had a roof large enough for us to go 100% solar. If you do, do it. Do it now. Even if you only have room for a small system, the savings – in terms of the environment and cash in your pocket – makes it worth looking into for almost all homeowners. If you have any other questions, ask away in the comments below, email me, or just stop me next time you see me. I LOVE talking about solar. For more information about installing solar panels in your home, here is a link to view all the posts in my Going Solar Series. Posted in Going Solar and tagged California, climate, customer, customer experience, results, solar, solar city, solar energy, solar panel installation, solar panels. Bookmark the permalink. We’ve been solar almost six months now and are getting great results. Once we have a full year of experience, I’ll do a complete breakdown of costs and energy generation. But, to share some perspective, I want to demonstrate how our electric bill breaks down for the month of August – generally our highest bill of the year. Our electric bill for August 2012 came in at a whopping $464.60, and that includes the discount we received by participating in SCE’s Summer Discount Plan. In total, we used about 2126 kwh (kilowatt hours). Yikes! The bill for August of 2013 also includes the monthly cost of operating our electric car that we did not own last year. So, when you factor in about $150 we spent in gas last August for my husband’s car, that brings our total monthly savings to $600! In one month! We drew 938 kwh from the grid this August, sold back 504 kwh to Southern California Edison, for a net usage of 434 kwh. In terms of charges from SCE for solar customers, here’s how it works – when your solar panels are working during the day, your energy generation goes first, to supply electricity to your own home, and second, back to the grid. If you generate excess energy during the day beyond what you consume, you sell it back to the grid. At night (when solar panels sleep along with us), you draw your electricity from the grid. If the amount you draw from the grid during the month is more than that you sell back, you owe SCE. If it’s the reverse, the electric company owes you. Solar customers are placed on an annual billing cycle, where charges and credits are accumulated throughout the year, and you true up at the end of one year of solar energy generation. So for the month of August (technically from July 22 – August 20th), we generated 1168 kwh from our solar system and drew 938 from the grid for a total usage of 2104 kwh. This is pretty close to our overall usage last year, but the difference is that 100% of our usage last year was from the grid and now the majority is coming from solar. Of the 1168 kwh of solar energy we generated, we used 664 and sold 504 back to the grid. Bottom line – a $14 electric bill! So for now, I’m basking in my $600 savings for the month. Even more reason to love the sun. Keep it coming! If you have any questions at all about going solar, ask in the comments below, email me, or find me on Twitter. I want to encourage more people to take their own journey to solar, getting off the grid and saving money. Less money, less guilt. You can’t go wrong. Posted in Going Solar and tagged California, climate, customer experience, going solar, Orange County, renewable energy, solar city, solar energy, solar panels. Bookmark the permalink. The day was finally here we had been waiting for – installation day. Our solar panel system is fairly large (7.2kw) so installation actually took two days. Installation was a breeze. The hardest thing was keeping my dogs from freaking out while a crew of people stomped across our roof. If we were overly concerned about hiding our system, we could have limited it to the panels on the side of our house that are virtually undetectable. I had a hard time even photographing them – in the photo to the left above. Because of the elevation of our house, you can barely see them from the street. Our main concern was generating as much solar power as our roof and the orientation of our house would allow, so we decided to maximize our roof space by using the area over our garage as well. Those visible panels don’t bother me at all. 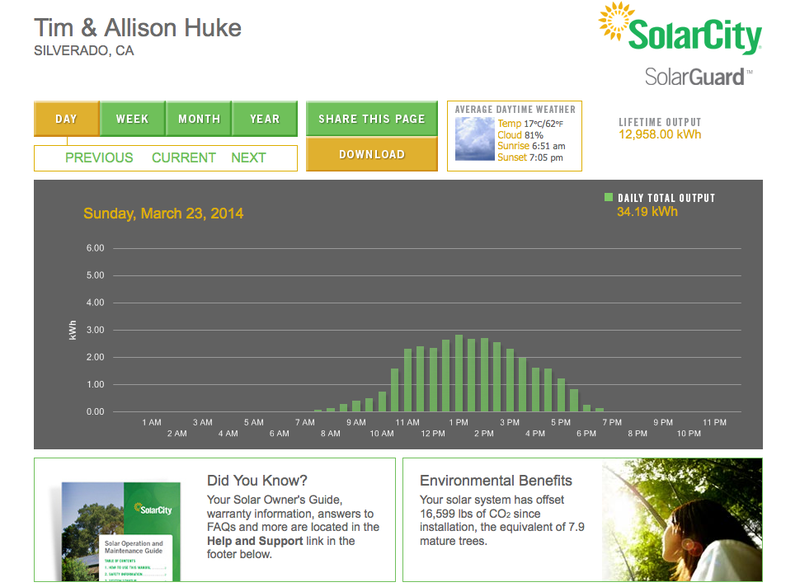 Where some may see “unsightly” panels, I see beauty (not to mention big energy savings – cha ching!). It’s all in the eye of the beholder after all. Unfortunately, once our installation was complete, we couldn’t just turn on the system and start generating our own power. There were still more steps to the process. First, an independent inspector had to come out to the house to review our entire system and submit a report to the utility company. Fortunately, the inspector was here within the week, our installation passed with flying colors, and he filed his report quickly with Southern California Edison (SCE). Solar City had warned me that SCE was taking about three weeks on average to clear solar systems for operation. I was pleasantly surprised, when just about a week after inspection, we got the go ahead from SCE to turn on our system. Next, I had to connect the monitoring device (that communicates information from the inverter to Solar City) to my wireless router. 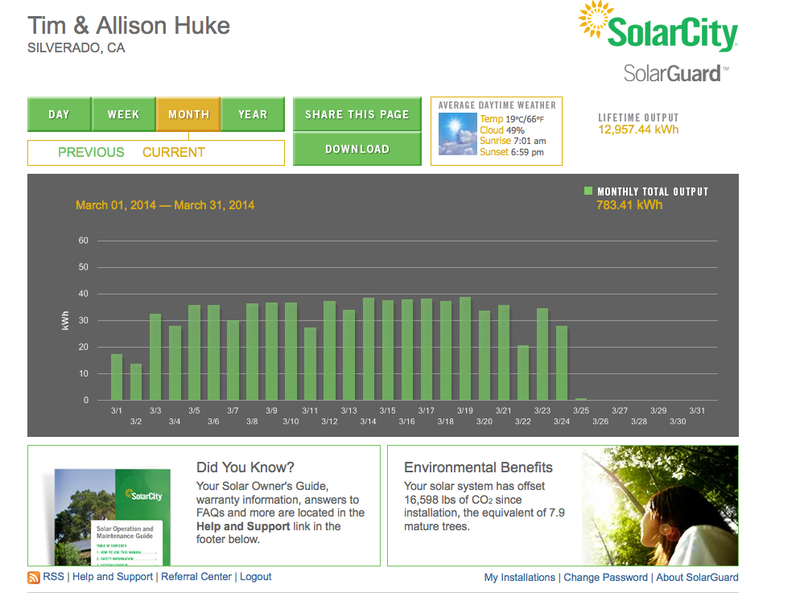 This allows me to monitor my solar generation online through Solar City’s SolarGuard program. 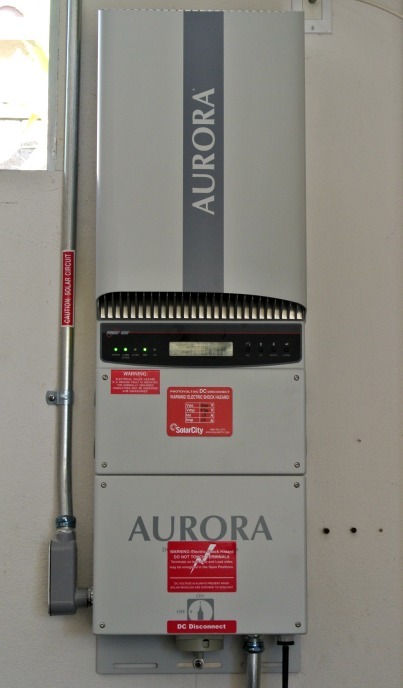 It also allows Solar City to monitor my system to ensure it is running smoothly and operating at full capacity. If there are any issues, Solar City will alert me and fix the problem. After a few minutes on the phone, we were in business. Solar energy started flowing into our system! We are a few weeks in to generating our own power now. It feels so good to know we are running our home from the sun. It gives me one more reason to smile on beautiful sunny days like today. And saying goodbye to large electric bills for the next twenty years or so is going to feel pretty good too. We are coming to the end of this journey but there is still one more step – the results! I’ll report back in a few months and let you know how it’s going. Posted in Going Solar and tagged California, climate, customer experience, Orange County, renewable energy, solar city, solar energy, solar panels. Bookmark the permalink. We finally got our solar panels installed last week. They aren’t operational yet…more steps in the process I will write about later. But first I need to catch up on the process so far. In my “Journey to Solar” series, I wrote first about the decision to go solar. Next, how to pay for it. The third part of this series discussed the engineering and energy audit process. Next in the series is step four – submitting rebate applications and applying for approval through the homeowners association. Government rebates (local, state, and federal) are still available. They can save you up to 50% off your system – but you’ve got to file the paperwork correctly and in a timely manner. Luckily, Solar City prepared everything for us. All we had to do was sign and send back the papers. They even factored the rebates into our final cost so we don’t have to wait for reimbursement. It was a piece of cake. The homeowners’ association approval, on the other hand, was not so easy. Through a combination of issues, the process took way too long. Here’s the thing about the association approval, it’s simple a go-through-the-motions approval. In California, an association’s power to deny or alter solar applications is limited. The California Solar Rights Act of 1978 protects a homeowner’s right to install a solar energy system by limiting an HOA’s ability to object to such installations through its CC&Rs. The Act does permit CC&Rs to include provisions that impose reasonable restrictions on installations. “Reasonable” restrictions included those that: 1) do not significantly increase the cost of the solar system, 2) do not significantly decrease the system’s efficiency or specified performance, or 3) allow for an alternative system of comparable cost, efficiency and benefits. “Significant” is further defined as those restrictions that increase the system’s cost by over 20 percent or decrease the system’s efficiency by over 20 percent. Basically, the HOA can not deny your application. They can require you to make changes, provided that those changes do not increase your cost by more than 20% or decrease the power of your system by over 20%. But while the HOA can not deny your application, you still do need to go through the formal approval process. 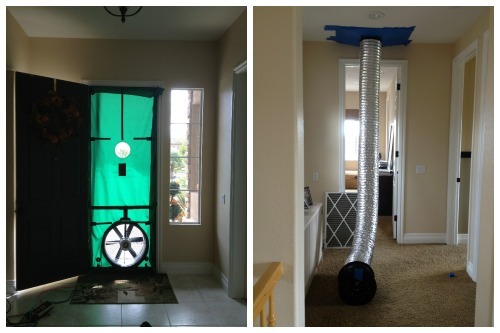 A California couple learned that lesson the hard way, when they had to remove panels not approved by their association in advance of installation. For us, HOA approval meant filling out the application, submitting our plans, and getting the signatures of our neighbors on all sides of our house (front, back, left and right side). Two of our neighbors are the easy “where do I sign?” and “thumbs up for solar” type. They signed right away. One neighbor I’m a little afraid of so I put it off, and put it off, and then finally made my husband go knock on their door. Luckily, he caught the husband in the garage and he signed right away. No questions asked – phew! Just one more to go. The last set of neighbors was a little more challenging. They needed “time to think about it” and were concerned the panels would be “unsightly”. They wanted to take a picture of our house, print it out, compare that to our plans, and draw the panels from the plans onto the photo (no, I’m not kidding). After that, they could assess just how “unsightly” the panels would be and decide if they would sign off or not. We said okay and gave them time and our phone number. We delicately explained that their approval was a courtesy more than anything and that we wouldn’t be offended if they checked “do not approve” on the project. About a week later, the last set of neighbors called and said they were ready to sign. They are and older couple, actually quite sweet. I feel a little bad because I think we caused an argument between the two of them – when the husband signed off on our plans, the wife was grumbling in the background about the “unsightly” solar panels that would soon be on our roof. We got out of there quickly, and with a last thank you, we had the signatures we needed and were able to submit everything to the association. Unfortunately, we submitted our application at the end of November, just before the holidays put a delay on everything, including HOA meetings. Our application was not presented to the board until January. After that, it took weeks of calling for me to finally get an answer. In the end, we were approved with no modifications or adjustments and were able to proceed with installation. While we were hoping to have the panels installed before the end of the year, we are only about a month off and happy that this step of the process is behind us. Installation was a breeze – I’ll cover that in part five. Then, inspection, approval, and the last step, turning the switch from fossil fuel to solar energy. Can’t wait! After determining that you want to go solar and deciding how you want to finance your project, you move on to making final decisions about your system and energy needs. At this point, the solar company sends out an engineering team to verify that the initial architectural plan is doable and feasible. The team gets up on the roof, crawls through the attic, checks the current electrical system, and takes lots of lots of measurements and pictures. This all leads to the final architectural plan. In our case, it did vary slightly from the original plan. The actual capacity of our roof to house the panels was a bit off, and our system is going to be just slightly less powerful than the original plan. After the final solar architecture is done, the next step in Solar City’s process is to conduct a Home Energy Evaluation, a comprehensive audit of how your homes uses – and loses – energy. …to analyze the “leakage” of your heating and cooling systems. They also check every appliance, every light bulb, and every window and crevice of your home. They crunch all that information and provide you with a report card of the energy usage of your home. The good news for us is that overall, our home is pretty efficient. It is well insulated, with little “leakage” of air from the outside in, and vice versa. Our dual-speed pool pump is a huge savings, as well as our LED and CFL light bulbs. A few things they did recommend: eliminate one or more refrigerators (we have a kitchen fridge, garage fridge, wine refrigerator, and kegorator – yes, I know, it’s total over consumption – perhaps the next episode of ecofessions? ); upgrade to more efficient air conditioning units; add an extra layer of insulation in the attic; and continue replacing any remaining incandescent lights with LED or CFL bulbs. The good news is that although our system is slightly smaller than originally planned, by incorporating some of these energy-saving measures, we can keep our solar energy to on-the-grid energy ratio in tact from the original plan. Next up…part four, applying for government rebates and getting association approval (the most entertaining part so far, I promise). Posted in Going Solar and tagged California, climate, customer experience, energy, environment, green, installation, Orange County, solar, solar city, solar company, solar panels, sustainable energy. Bookmark the permalink. Once you make the decision to go solar, the next step is deciding how you want to pay for it. Solar has come a long way from the days of buying the panels outright. Today’s solar is flexible and can accommodate many different budgets. 1. Purchase – this is the oldest and was the most common way to go solar years ago. Basically, you purchase the system, and apply for and receive all your rebates from the Federal and State government directly. Once you have the system installed, it is yours forever, but you are on your own for maintenance and service outside of the warranties. These days, very few customers go with this option. 2. Pre-Pay – This relatively new plan allows you to “pre-pay” your solar energy usage for a set period of time – generally 20 years. You pay a set amount upon installation of your solar panels – essentially, what you would pay for the kilowatt hours (kWh) at today’s rates, and then get all of your solar energy at no additional cost for the next 20 years. In fact, if your solar system does not generate the guaranteed amount of kWh on an annual basis, the solar company will be sending a check to you each year. At the end of the twenty years, you can renew your plan (at discounted rates) or turn the solar panels back in to the company. This plan includes system monitoring, repair service, insurance coverage, and a performance guarantee for the duration of the contract term. 3. Solar lease or Solar PPA – Both of these options essentially boil down to a zero-money-down situation, where you pay a monthly amount to the solar company once your panels are installed and up and running. They offer similar financial advantages to the homeowner. The primary difference is that with a lease you pay a set amount per month, and with a PPA you pay per kWh. One of the benefits of the SolarPPA is that you can purchase the system any time after year five. Availability of SolarPPA and SolarLease vary by location based on what your local utility company prefers. This plan also includes a “buy-out” at the end of the term, or turning panels back in to the solar provider (if they even want them at that point). Both of these plans offer flexible payment options, system monitoring, repair service, insurance coverage, and a performance guarantee for the duration of the contract term. One thing I like about going with a full-service company like Solar City, is that regardless of which payment option you choose, they take care of every step of the process —including engineering, financing, permits, installation and ongoing monitoring. In our situation, the Pre-Pay plan was the best deal by far – even better than purchase. With an initial investment of $22,000, it was calculated that we would save $90,000 in energy costs over the twenty-year period. With the payment plan, we could invest nothing initially, pay a set $235 per month for twenty years, and save around $60,000 in energy costs over the lifetime of our contract. So our decision was whether we finance through the solar company at a set price of $235 per month – effectively paying them $53,000 over twenty years, or find a way to pay them an initial investment of $22,000 (even if we have to borrow money to put that down). For us, the flat fee of $22,000 made more sense. Money is so cheap these days, with interest rates at all-time lows, we just think that the initial payment makes sense financially. If you have access to cheap money through a line of credit, or savings, or even selling some investments, I think it makes sense. I mean, what investment is going to guarantee a return of $90,000 over the next twenty years? In both scenarios, we would still have a small electric bill depending upon our energy usage. Also, it was projected that we would save a few thousand dollars on our electric bill per year initially, but that amount moved up to almost $9000 per year in year twenty of our agreement. The reason the savings are so high is that unlike electricity, the payment to the solar company is set per month, with no increase, over the course of twenty years. With energy prices rising approximately 39% over the past decade, and estimated to continue, by locking in your energy costs now, you save a bundle over the next couple of decades. Even if we decide to sell our house, the solar agreement is transferable, or we can transfer the solar panels to a new home. What’s more, homes that have solar panels are shown to increase in value by 3-4%, which for most people, covers the cost of the system. But everyone’s situation is different and each buyer has to make the decision that is right for them. 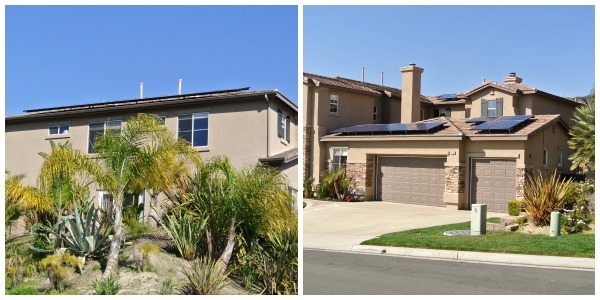 The bottom line is that no matter what option you choose, you are going to save money in the long-term by going solar. For more on solar financing options, you can check out this link. Posted in Going Solar and tagged climate, customer experience, energy, environment, green, installation, kilowatt hours, Orange County, residential, saving money, solar, solar city, solar company, solar panels, sustainable energy. Bookmark the permalink. We are in the process of going solar at our house. I want to document our journey to demonstrate how simple, easy and cost-effective it can be. And hopefully inspire some of you to consider solar panels for your own home. We are a few steps down the road at this point, but I’ll start back at the beginning with Step One – making the decision to go solar. 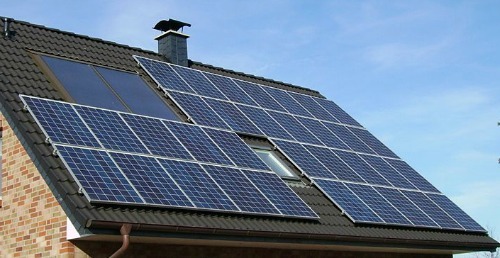 The reasons to choose solar energy are numerous and well documented. Let’s just say for me, it breaks down to either powering our home using solar (a clean, non-polluting, completely renewable energy source) or continuing to run off fossil fuels (a finite source that pollutes our water and air, and is a primary contributor to climate change). It’s kind of a no-brainer. With that said, I will focus primarily on the financial aspects of going solar. Quite simply, it can save you A LOT of money. In general, when looking at solar purely from a financial perspective, it makes sense for those who own their homes, are planning to stay there in the near future, and generally have an electric bill that is over $150 per month. For us, our journey to solar started shortly after we moved last year and received our first electric bill – over $400! I couldn’t believe it. I had never seen an electric bill over $200 in my life. Since then, we have implemented some energy-saving, cost-cutting measures, like switching all our bulbs to CFL or LED, turning off appliances not in use, and installing a new dual-speed pool pump (that alone has saved us about $75 a month). With these measures, we have reduced our bill to about $300. Still, way too high, and using far too much energy from the grid. So, I started interviewing solar companies. It turns out, we can go solar for no money down, lease the panels for around $200 per month, and reduce our electric bill to about $40. That means, we can start saving money every month, right away, with NO MONEY OUT OF POCKET. Not only that, but as the years go by and Edison’s rates continue to increase (vs. our fixed-lease rate for our panels), we save even more money. I’ll give you more details and the full breakdown in my next post. The next step is to select a solar contractor to perform the installation. 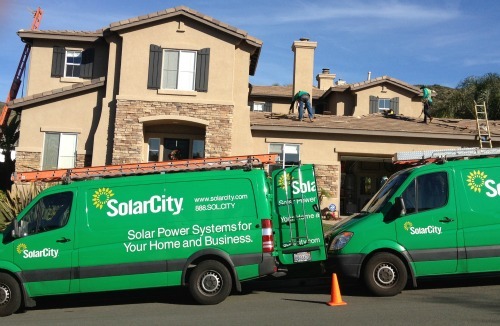 After looking at many companies, and meeting extensively with three, I settled on Solar City. So far, I am very happy with my decision. Solar City’s service is excellent, their technicians are timely, and they take care of the entire process for you – including engineering, financing, permits, installation and ongoing monitoring of your system performance. Now, we are on our way. Actually, the van showed up today to get us moving forward. I was so excited. I felt like a kid on Christmas. In my next post, I’ll break down the three main ways you can pay for solar, how the math works in our case, and how it may work for you too. For a good overall summary of the process, check out this short, informative video, “Affordable Solar Power and Better Energy”. Posted in Going Solar and tagged climate, customer experience, energy, environment, green, Orange County, renewable, renewable energy source, residential, saving, solar, solar city. Bookmark the permalink.